We are in the middle of our second charter. Our first charter went really well. The family were great fun and we ended up really good friends by the end of it. While the charter went well we had problems with the boat along the way. The Genset would not run for half the time and for half the time it was running it was down on voltage. The big problem with the generator not going was the air conditioners would not work. Sometimes I think we are running a self sufficient floating motel room not a boat. The other problem we had was a tank of dirty fuel in the outboard on the dinghy which required me to strip the carby and blow out the jets. Certainly seems this job is more about the greasy bits than the sailing. 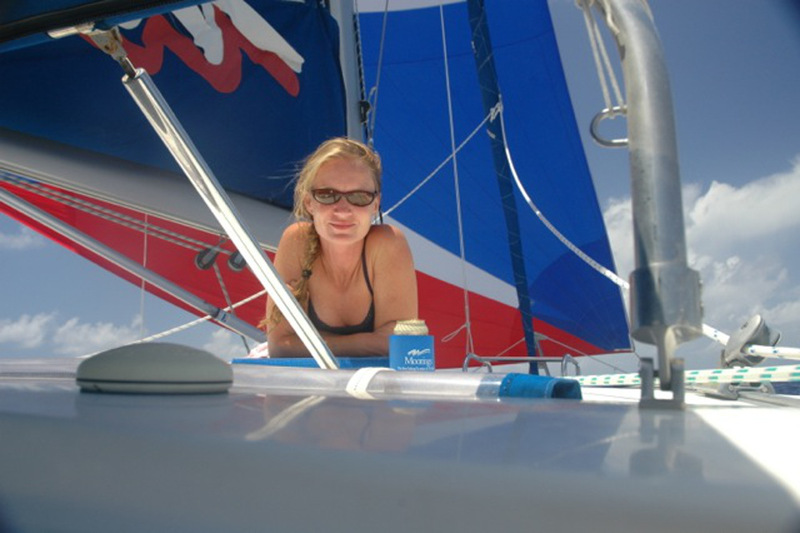 Melanie is finding she has to spend many hours in the galley to keep the food up to the expected standard, which I think she is finding pretty tuff particularly while I’m taking them snorkeling on pristine reefs or dragging them around the bay on the biscuit behind the dinghy. On the topic of the food she is doing a great job, cheese cake, chocy mouse, strawberry mouse, home made bread, chocolate cakes, fish terrines, I hope this doesn’t stop when we get home. Any way the first charter went really well with a very nice tip at the end and it wasn’t the “get a hair cut” variety. O n the subject of money how is the Greenback going? I think the only news we get over here is Australia is flogging the Kiwis in the cricket. The region we are in at the moment is very much a cricket loving part of the Caribbean and everybody can tell us how Australia is going. On the sports front any football news would be greatly appreciated. Well we have successfully completed our first 2 charters with happy punters at the end. The second charter with the owner proved to be a real test of patience particularly for Rocket. They have told us they have a live in “Alice” (aka Brady Bunch) who has lived in there house for the last 45 years. They also said there dog likes Alice better than them! We’re not surprised. 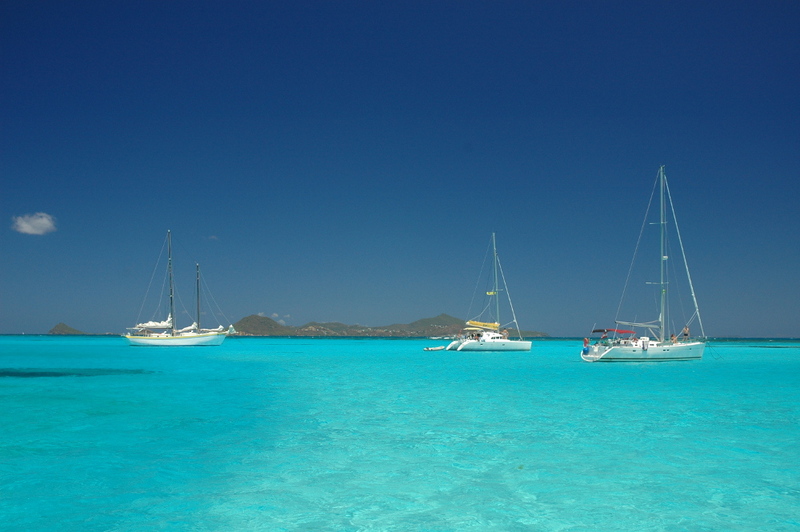 So the charter finally ended and we sailed down to the Tobago Cays for a couple of days with our friends that run the 62. We had 2 solid days of Kite Surfing, drinking beer and relaxing in pristine conditions. The wind was blowing about 20 knots steady from the east and apart from giving the body an absolute flogging it was fantastic. Kind of made the week with the owner seem about a month ago. Yesterday we had a day in Canouan our official base. We went for a dive with the local dive shop which was really nice. The diving down here is really good and cruisey. We are currently on our way back to St Lucia to pick up a heat exchanger for the genset. We will probably spend a day or 2 there and then head for Tortola which is about 350 miles away. After a few days in Tortola we will be heading for the Bahamas about another 1200 miles. We will most likely stop at San Juan and Turks and Caicos on the way. We are both looking forward to the next phase of our adventure. It will be good to catch up with some of the friends we made in Tortola, and the trip to the Bahamas will be mighty. Still a pity to not to have anyone to share the experience with. (Mel) Starboard engine overheated and David is in the hot box trying to fix the greasy bits – I believe an impeller is stuffed. Still in St Lucia – still no heat exchanger, surprise, surprise!! Still getting used to the Caribbean way, it will probably get here when we we arrive in the Bahamas, then eventually they will send it up there as we are leaving to get back down here. It will be one well travelled heat exchanger. I may have the crapiest job on charter – but David has the crapiest job at the dock – stuck in the hot box engine rooms dealing with greasy bits, while I get to clean inside in the lovely air conditioning. Chante and Stuart have become great friends with similar interests. The 4 of us spent from about 8am to 6pm kiting in the Cays one day, changing kites in the water. I will miss there company when we are in the Bahamas. There is only one other crewed yacht up there, so socialising off charter, probably won’t be a big thing. It seems that when the boats, don’t have bookings, it is O.K. to have family and friends along. Something for everyone to keep in mind, particularly given we will only be about 100 miles from Florida and I’m sure if we wanted it would be no problem to take the Meltemia there. Just a short one this time as we are getting pretty busy in the lead up to our first charter. We have 2 back to back out of Canouan. There is virtually no provisioning available in Canouan so when we leave St Lucia this time we need to be provisioned for both charters, except for fruit, veg and bread which we can get reasonably at local island markets. The provisioning is really putting a lot of pressure on Mel as even in St Lucia things are hard to get and everything is expensive, so coming in under budget is a real challenge. Since the last update we have spent 6 days “down island” checking out all the places we will be taking the punters. I’d like to say it’s been hard work but it hasn’t. In fact its been the opposite, more like a paid holiday. Well it’s been harder for rocket as she has been practicing cooking, getting the hang of the oven etc. I have been doing some work on learning boat systems etc and studying pilotage books and charts of the area. We left St Lucia am on Wed 9th after clearing immigration and sailed about 70 miles down to Bequea arriving in Admiralty Bay in the dark. Friendly, helpful, people, beautiful little bay. Next day we went to Mustique for lunch, apparently many wealthy, famous people have holiday houses there, Tommy Hilsomething, Shania Twain and Mick Jagger. Then on to Chatham Bay on Union Island. A really quiet undeveloped island. We then went to Petit St Vincent for lunch. Across the channel, 150 metres from PSV is Petit Martinique a different country, we were having seafood for the charter delivered there on the local ferry from Grenada. After picking up the seafood we went to Salt Whistle Bay on Mayreau island. The classic tropical bay and beach. A great little bar for Pina Colodas and Planters Punch while the sun sets. We felt it was imperative to test the cocktails and ambiance of a sunset drink so that if necessary we could give a accurate appraisal to the guests. One thing that is odd here is spirits are cheaper than the mixers. A litre bottle of Mount Gay is about US$8.00 and coke is about US$2.00 for 300 ml, so the mixed drinks are cheaper than beer and the measure of rum is really generous. Then onto the Tobago Keys. The Tobago keys to this point would probably be the most amazingly beautiful place we have been. The clearest water and amazing coral reefs. We anchored for the night on the eastern or Atlantic side of the Keys. It is protected by 2 horse shoe shaped reefs. It is the most amazing place, have to see it. From Tobago to Canouan our home base for lunch. There is nothing there except 2 lovely resorts, one very exclusive owned by Donald Trump. It costs US$85.00 just to look at it. Then back to St Lucia with a night in Bequea on the way. We now have 3 days for maintenance and provisioning before heading down to Bequea for our first charter. Thats about all for now, sitting here listening to Kevin Bloody Wilson while I write this an d it’s just struck me what a unique sense of humor we Aussies have. Any football news would be greatly appreciated, or any other news from Oz at all. Stay tuned for more On Tour Adventure.